ROCKFORD, ILL. (October 3, 2018) – Emerson (NYSE: EMR) today announced the expansion of Greenlee’s test and measurement offerings to include the 5882A 1kV Megohmmeter and 5990A 5kV Megohmmeter. The new measurement-sensitive megohmmeters have a large LCD bright display, preset test voltage settings for quick adjustment and enhanced carrying features capable of managing rugged field use. The new handheld 5882A 1kV Megohmmeter is designed to test insulation resistance measuring up to 200GΩ. It has a safety voltage rating of CAT IV-600V and is CE marked and cETLus certified. The 5882A has five preset test voltages: 50V, 100V, 250V, 500V and 1000V, and three preset alarms: Continuity, Resistance and Voltage. A large backlit digital display and compact, well-spaced buttons make the tool easy to use and minimize errors on the job. Engineered with productivity and accuracy-enhancing features, the 5882A includes a 300-entry data storage, a timer to ensure data accuracy and selectable automatic five-minute standby mode to extend battery life. The 5882A has a molded-in magnetic mount and non-slip pads integrated onto the back allowing convenient for hands-free measurements. A durable non-skid over-molded rubber holster protects the meter from debris. The 5990A 5kV Megohmmeter is designed for insulation resistance tests up to 1TΩ. Similar to the 5882A, the 5990A has a safety voltage rating of CAT IV-600V and is CE marked and cETLus certified. It has five preset test voltages of 250V, 500V, 1000V, 2500V and 5000V. A large, bright blue digital LCD display provides easy to read results making it ideal for reading in lowlight situations. The 5990A performs an automatic calibration on start-up and an automatic discharge after measurement completion. The 5882A has a large rotary switch and well-spaced button designed to enhance function selection and accuracy even with gloved hands. A handle and shoulder strap built into the unit and an all-in-one heavy-duty Greenlee bag facilitate easy transportation. The 5990A has an expanded test lead set. 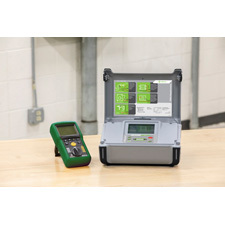 Backed by a lifetime limited warranty, the new Greenlee 5882A 1kV Megohmmeter and 5990A 5kV Megohmmeter are now available. Contact your local dealer by visiting Greenlee.com/where-to-buy. For more information, visit www.Emerson.com.